It’s the ultra-modern style of cooking. Although, all the way back in the 1800’s cooks and scientists were interested in understanding food chemistry. But it was not until 1988 that the term “Molecular Gastronomy” was coined by French chemist Hervé This and Hungarian physicist Nicholas Kurti. 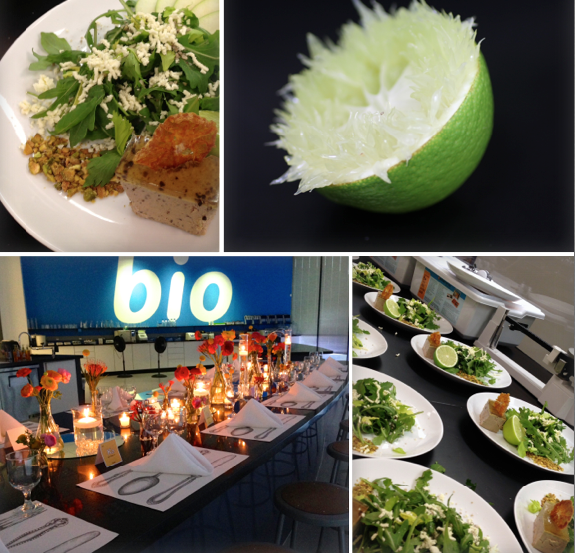 They began holding workshops to investigate the transformation that occurs when food is cooked. The molecular or modernist cuisine movement really began when chefs took those scientific discoveries and applied creativity to that body of knowledge. They take the basics of classic cooking and craftsmanship then apply chemical compounds and elements such as liquid nitrogen for instantaneous freezing and techniques such as spherification (forming a liquid into a solid orb which remains liquid on the inside) and gelification (turning a liquid into a gelatinous form by using a gelling agent) to push the culinary envelope. 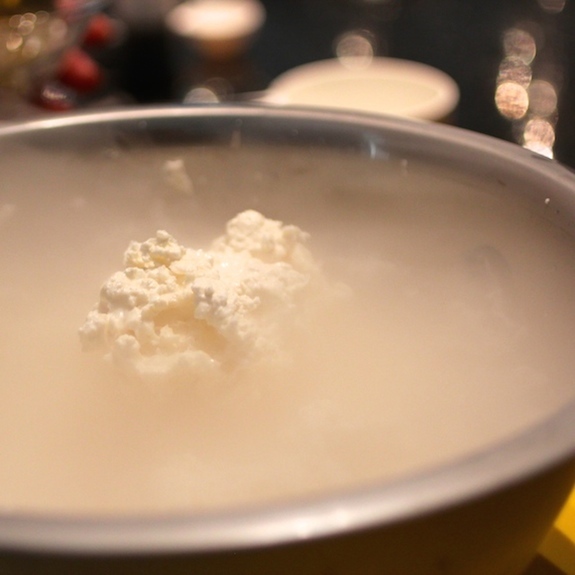 They create foams, and airs, and aromatic smoke to surprise and delight diners. The essence of the original dish is preserved but the appearance is significantly altered. Equipment like centrifuges, immersion blenders, dehydrators, and whippers are used to produce unexpected contrasts of flavor, texture, and temperature. This style of cooking can have broad appeal, beyond science geeks or chefs singularly looking to generate the wow-factor. First and foremost, the food must taste good, then it can go further to bewitch the senses and boggle the mind. While modernist cuisine is precise, and can be tedious – where ingredients are often weighed to the gram – this technology is useful. Home cooks can benefit from their discoveries, which can be applied to something as simple as boiling an egg. Modernist wizard Chef Wylie Dufresne of New York’s wd~50 restaurant, explains that eggs have a fairly low pH and when they cook the white tends to grab on to the shell. To make the shell easier to peel, he adds baking soda to the water, raising the pH of the water and helping the white pull away from the shell. Boil a fresh egg for exactly 5 minutes 45 seconds, then immediately immerse it in an ice bath to stop the cooking. The egg will slip easily out of the shell. Re-warm the shelled egg for a few seconds in hot water, then serve the perfect soft-boiled egg with a firm white and a runny yolk. Science does not take the romance out of cooking, it can make us better cooks. Catalan Chef Ferran Adrià is one of the fathers of nueva cocina, as the modernist style is called in Spanish, or “deconstructivist” as Adrià himself refers to it. Until 1986 he cooked traditional cuisine at El Bulli (The Bulldog), a seaside restaurant 2 hours north of Barcelona. One off-season he was attending a cooking demonstration by inventive Chef Jacques Maximin when someone asked what creativity was, to which Maximin replied, “Don’t copy.” Don’t. Copy. Invent! It’s a philosophy Dufresne ascribes to as well. 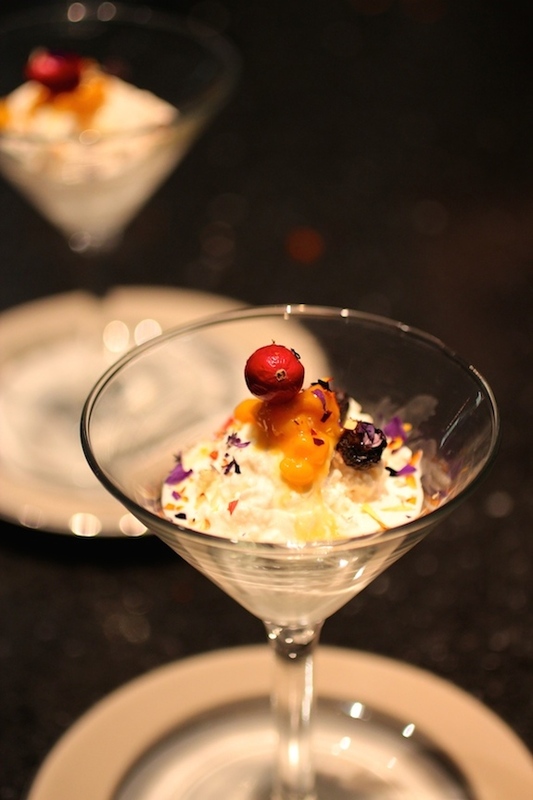 Adrià took that advice to heart, and returned to El Bulli to create dishes never seen before. Unorthodox dishes that bewilder and astonish such as a spherified appetizer of liquid olive, frozen Parmesan air, or transparent ravioli made of soy lecithin and potato starch. El Bulli went on to receive 3 Michelin stars, the highest rating, and became one of the world’s best restaurants until its closing in 2011. Although the artistry and many techniques are complex and require special equipment, there are some dishes that can be easily recreated by the home cook. In the recipe below, tomato water is turned into a gel. All the ingredients can be found at local supermarkets and the only special equipment required is a food processor and fine mesh sieve. Molecular gastronomy kits are available on-line for those looking to experiment further with avant-garde cuisine. 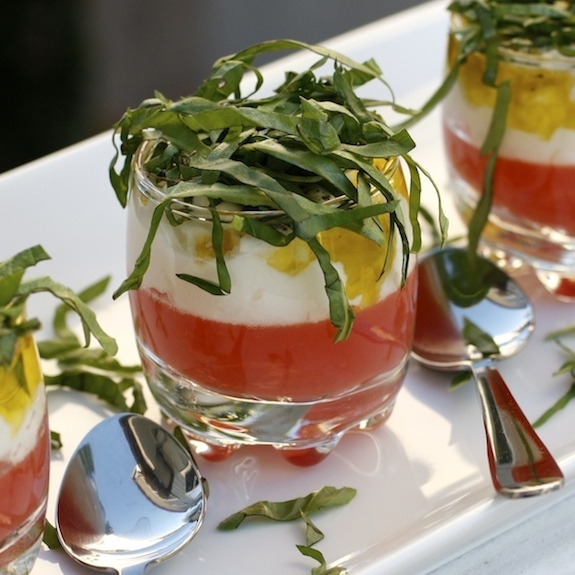 Fans of the ubiquitous Caprese Salad made with sliced tomatoes, mozzarella, basil, and olive oil will go wild over this unique Caprese Verrine. Freshly extracted tomato water combined with sea salt and gelatin creates a smooth gelée tasting of pure tomato! It’s layered with chopped burrata (a fresh mozzarella stuffed with shreds of cheese soaked in heavy cream) with wonderful sweet creamy flavors. Finished with bright fresh basil and extra virgin olive oil – this little 2 oz. 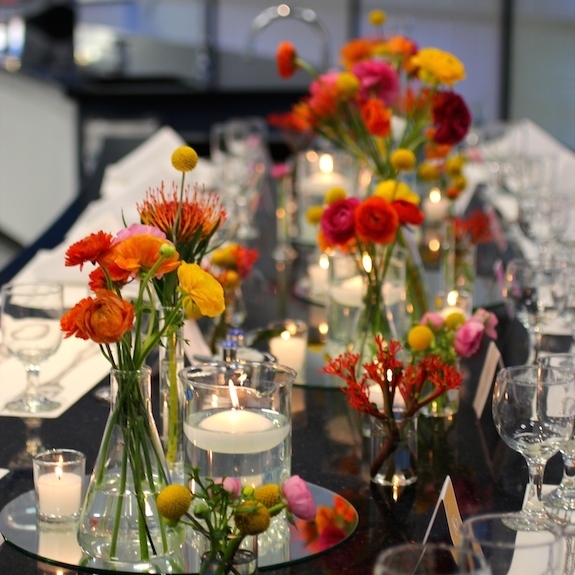 verrine is one of our favorites for modern entertaining. Blend tomatoes in a food processor with a bit of sea salt. Press the tomato pulp through a fine mesh sieve to extract all the tomato water. Place 1/4 cup cold water in a small bowl. Sprinkle gelatin over the water, let stand 10 minutes. Bring 2 cups of tomato water to a simmer in a sauce pan. Add gelatin and stir gently until gelatin is completely dissolved. Scoop off any foam. Gently pour tomato water into 2 oz. verrines (little glass jars) to half-full. Let cool to room temperature. Cover and refrigerate until set (8 to 24 hours). Chop cheese to a cottage cheese-like consistency. Then spoon the burrata on top of the gelée. Drizzle with olive oil. Season with sea salt and fresh ground pepper. Top with a chiffonade of fresh basil. Remind your guests to dig their spoon all the way down to get all the distinct tastes and textures in one bite. 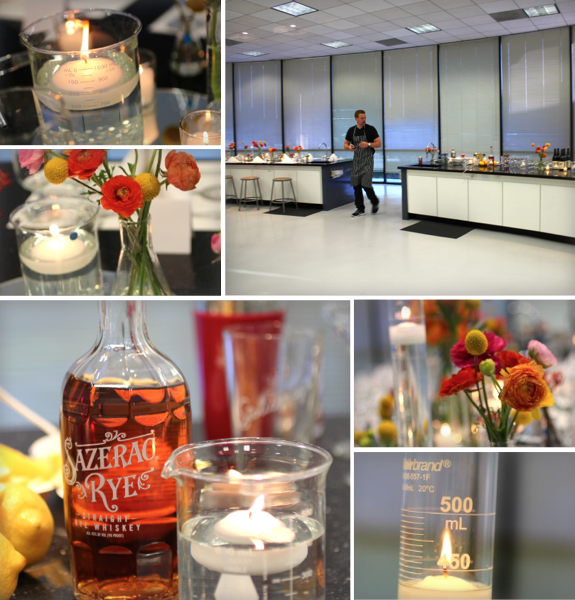 Many of these photos are from our recent molecular catering at Experium Science Academy in Torrance, California. 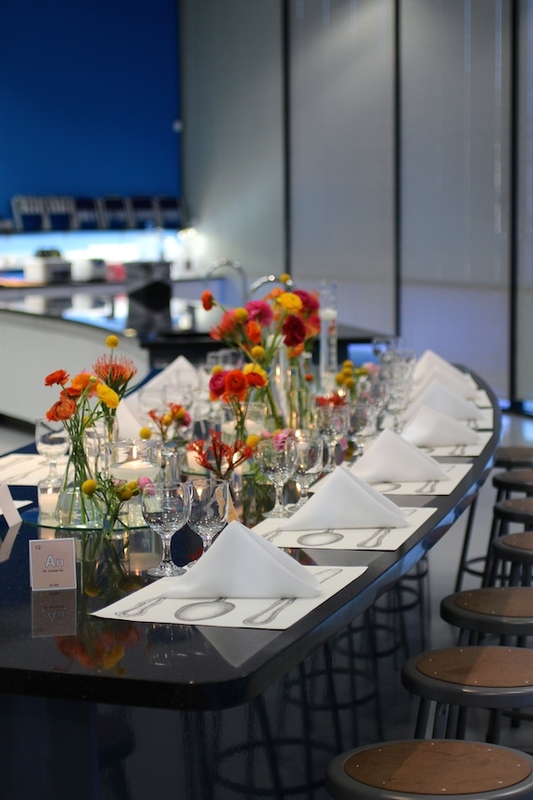 Our goal was to incorporate modernist techniques into each course while simultaneously creating a tasty and satisfying multi-course meal. 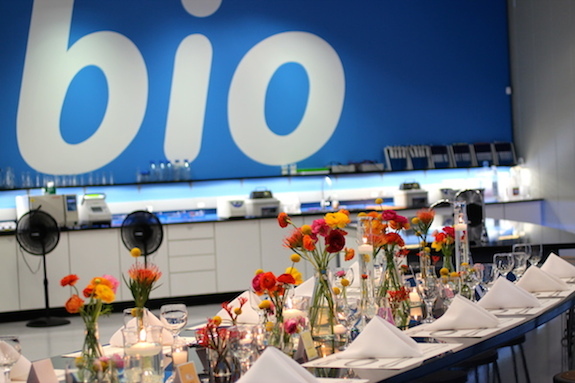 Our event was unique as not only was the dinner served in a working laboratory, Experium scientists were there to explain the science behind the culinary techniques. 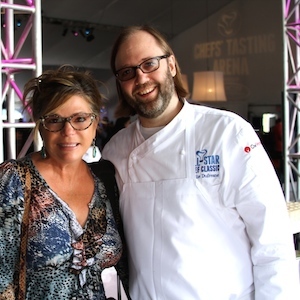 Very cool experience you had and great menu. 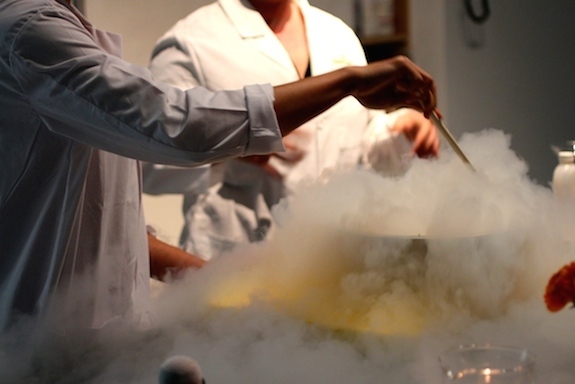 I have dabbled in molecular gastronomy and even made liquid nitrogen ice cream once. Kinda a funny made it with a foodie friend who is on physics. He ‘borrowed’ the stuff and we made it secretly on the campus grounds lol. I haven’t tried doing anything molecular in my kitchen but I sure am a fan. It’s like a magic show on a plate. What an interesting post to which I shall return! Yet we are all individuals and vive la difference. Yes, I do appreciate individuality and originality but this does go past my comfort zone . . . during the past few years I have found myself returning to basics of superb ingredients and simple modes of presentation . . . .